Former FBI Director James Comey called for the release of any recordings of conversations he had with President Trump in the White House, as well as memos he wrote detailing the private talks at the time. 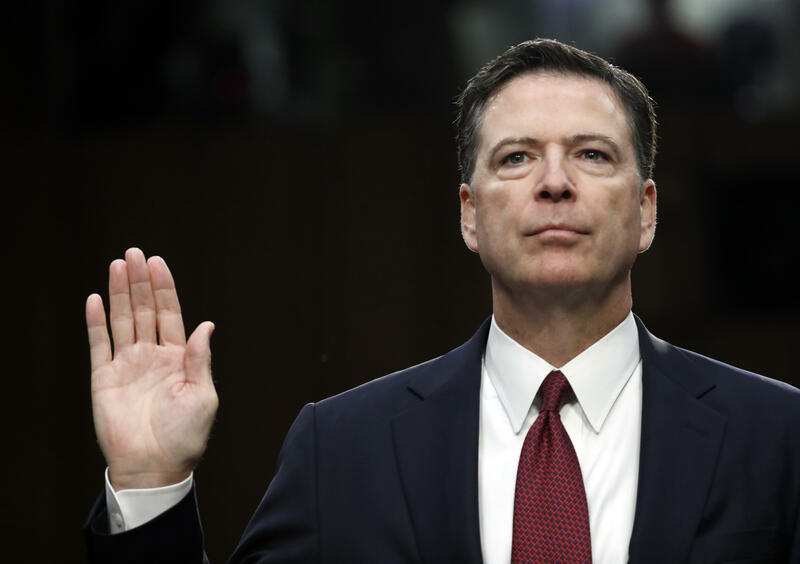 Comey made his first public remarks since his abrupt May 9 firing during high-profile testimony before the Senate Intelligence Committee Thursday. He was eager to disclose details of his conversations with the president, which he characterized as awkward and inappropriate, given the FBI's investigation into possible coordination between Mr. Trump's campaign and Russia. Comey told the committee he kept contemporaneous notes immediately following nine private conversations with Mr. Trump. He said he turned those memos over to former FBI Director Robert Mueller, the special counsel appointed to oversee the Russia investigation. On May 12, just days after his firing, Mr. Trump tweeted that Comey "better hope that there are no 'tapes' of our conversations before he starts leaking to the press!" "I've seen the tweet about tapes. Lordy, I hope there are tapes," Comey said Thursday when discussing a February 14 meeting at the White House. During that meeting, Comey said Mr. Trump told him he hoped Comey would drop the investigation into former national security adviser Michael Flynn. Later in the hearing, Comey returned to the subject of possible recordings. In an exchange with Democratic Sen. Joe Manchin of West Virginia, Comey was asked whether he believed a recording system existed in the White House. "It never occurred to me before the president's tweet," he said. "I'm not being facetious. I hope there are, and I'll consent to the release of them ... All I can do is hope. The president knows if he taped me, and if he did, my feelings aren't hurt. Release all the tapes. I'm good with it." At the White House, deputy press secretary Sarah Huckabee Sanders told reporters she did not know whether such a taping system existed. When asked to find out, Sanders joked, "I'll try to look under the couches." Comey also said Mr. Trump's "tapes" tweet led him to ask a friend, Columbia law professor Daniel Richman, to disclose the contents of his memos to the press in the hopes of prompting the appointment of a special counsel. The existence and substance of the memos were first reported by the New York Times on May 16, one week after Comey's firing and several days after the president's tweet. Comey told senators Thursday that he realized three days after Mr. Trump's tweet that recordings of his conversations might corroborate his own account. "I woke up in the middle of the night ... because it didn't dawn on me originally that there might be corroboration for our conversation," Comey said. "There might be a tape, and my judgment was I needed to get that out into the public square. And so I asked a friend of mine to share the content of the memo with a reporter. Didn't do it myself for a variety of reasons, but I asked him to because I thought that might prompt the appointment of a special counsel, and so I asked a close friend of mine to do it." Richman confirmed to CBS News he was the friend Comey asked to leak the memos, which are now in the possession of Mueller, the special counsel.